Feb. 12, 2014 9:00 a.m.
Ironically, the Year of The Horse has begun with controversy over the ESRD’s (Environment and Sustainable Resource Development) decision to go ahead with a capture season for wild horses located in the eastern slopes of the province. The capture season will run until March, 2014. The announcement has elicited an outcry from concerned citizens and horse advocacy groups who question the reasoning behind this decision, and want to see a halt on the capture. They feel that it’s an unnecessary move and fear that many of the animals captured could end up being slaughtered. The ERSD conducted an aerial count of the horse population in March 2013, which this year’s capture is being based on. From this, it was estimated that 980 horses are roaming the province, spread over roughly 2.2 million hectares. 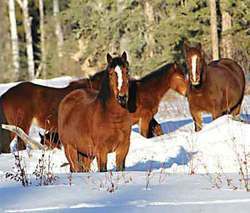 From a statement provided by the ESRD, “Environment and Sustainable Resource development has approved Licences to humanly capture up to 20 per cent, which is less than 200 horses, from the Eastern Slopes. As recommended by the stakeholders, including the Alberta Veterinary Medical Association and Agriculture and Rural Development, some of the captured horses will be tested for Equine Infectus Anemia. The Feral Horse Advisory Committee was made up of; Alberta Equestrian Foundation & Alberta Horse Alliance of Canada, Alberta Farm Animal Care Association, Alberta Professional Outfitters Society, Alberta Society for the Prevention of Cruelty to Animals, Alberta Veterinary Medical Association, Alberta Wilderness Association, Capture Licence Holders, Livestock Identification Services LTD., Rangeland expert at University of Alberta, RCMP Livestock Investigator, Rocky Mountain Forest Range Association, Spray Lake Mills, Sundre Forest Products and the Wild Horses Society of Alberta. One of the most strongly contested points is the horse count for the Williams Creek area, which the ERSD put at roughly 169, which many people felt was too high. The Help Alberta Wildies group felt so strongly about it that they conducted an aerial count of its own on February 8, 2014. Even with widening the search grid, 103 horses were counted. Of these horses only 9 were colts of yearling age. Coinciding rallies were also organized by the group and held on February 6 at McDougall Centre in Calgary and The Legislature Building in Edmonton. Another rally is being planned for February 15 at 1:00 pm at McDougall Centre in Calgary. When contacted for comment, Nikki Booth indicated that this was a misquote, and in fact, she expects that the horses captured will be adopted for recreational use. “The ERSD wants to see a healthy feral horse population in the province of Alberta.” Asked if the new aerial count provided by Help Alberta Wildies might prompt a halt to the current capture to recount, Booth indicated that a new count by the ESRD would be happening in March of this year. “Captured horses become the property of the licence holder, who may keep the horses for personal use or sell them. Some horses may also be made available for adoption through horse rescue organizations.” (ESRD statement). Bob Henderson, President of Wild Horses of Alberta Society (WHOAS), says he feels that the capture season is unnecessary thanks to Mother Nature this year. This winter has been very harsh and the flooding last year left wet conditions that were very unfavourable to foal survival. Of concern to Henderson is the lack of scientific study on the horses and their impact on the environment, “We simply don’t know how many horses the land can sustain because there are no comprehensive scientific studies available on the horses, their reproductive rates, their impact on the land and how many horses the land can support.” Wild Horses of Alberta Society has a Facebook page and a website. Another voice for the horses in this protest is the Facebook page, Alberta’s Wild Horses. A Heritage Animal. Federal Petition. This site is dedicated to securing Heritage Animal Status for the wild horses of Alberta. The horses are now considered feral, and as such, fall under The Stray Animals act. Perhaps the biggest point of disagreement is the fact that there are no guidelines on what horses can be captured with pregnant mares, foals and stallions all fair game. “If one distills all the information, data, and opinion, the debate is truly about the people who will never accept convenience killing as a form of population control and those who do. I will not be convinced that we can’t do better than sending pregnant mares and foals to slaughter when we easily have access to humane contraception methods for horses,” Dr. Judith Samson-French, Canadian Veterinary Medical Association Humane Award 2013. More information can be found on Dr. Judith Samson-French’s Facebook page. Contraception for horses is currently being used successfully in the U.S.
Maybe the only thing that can be agreed on at this point is the need for further study of the issue and exploration of alternative methods of controlling population if needed.